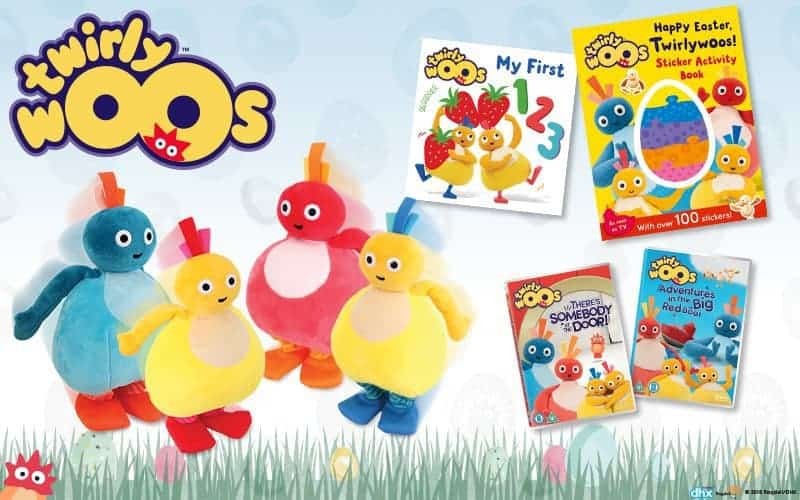 Celebrate Easter with the Twirlywoos and this range of colourful, fun, high-quality products which include toys, books, DVDs, and accessories. The adorable Run-Along Fun Sounds Twirlywoos from Golden Bear provide lots of fun and giggles as they run along, just like in the show! Press their hand and watch them come to life. Don’t forget to listen out for their signature tune as they move. Little ones will love interacting and playing with them over and over again! Join the Twirlywoos in a collection of favourite episodes in Adventures in a Big Red Boat, from Abbey Home Media. Episodes include Pop Bigger and Bigger High and Low Balancing Joining Up Smaller Hiding Pulling. And there’s further fun to be had in There’s Somebody At The Door, also from Abbey Home Media. With over 100 stickers and a beautiful egg-shaped jigsaw to complete, Happy Easter, Twirlywoos! From Harper Collins will delight any Twirlywoos fan this Easter! And My First 123 Book also from Harper Collins is a bright and appealing board book, the perfect holiday reading companion. To help you have lots of Twirlywoos fun this Easter, Boo Roo and Tigger Too are lucky enough to have a Twirlywoos Easter Bundle to giveaway to one reader. has to be Great BigHoo ! My little one loves toodloo! my grandson loves the greatbighoo. My kids lover Peekaboo and would absolutely love this. We love Great Big Hoo! My son likes Peekaboo the most. Toodloo is our favourite but all the characters are very appealing. We love Peekaboo. My son finds him hilarious. It has to be Great Bighoo! Great Big Hoo is our favourite! Unlike the Teletubies and the characters from In the Night Garden, I don’t know the Twirlywoos. But as my favourite colour is blue, I will go with that one. Great BigHoo is believe his name is (Thanks google). Great Bighoo and Peekaboo too … all of them really because they keep the grandchildren entertained! My son and I think Peekaboo is very cute! It has to be Peekaboo!!! Who doesn’t love that name!! Best game ever to make a baby giggle!!! The Very Important Lady always makes me laugh! My daughter adores Peekaboo. In absolute hysterics at his antics. Her laugh is so infectious when Peekaboo comes onto the screen. Toodloo is our favourite. Great prize, thank you!